This 72' Uniesse yacht is a lot of boat for a great deal! : Atlantic Yacht & Ship, Inc. This 72′ Uniesse yacht is a lot of boat for a great deal! Are you in the market for an used Uniesse yacht for sale in the United States? Then you must see this 72′ Uniesse Yacht that Brent DeSellier has for sale in Florida! After all, with a recent price reduction, the owner is ready to sell! In the first place, this used 72′ Uniesse yacht was launched in 2004. In fact, she has been kept under cover at a marina in Fort Lauderdale. You will love her four stateroom / four head layout. Moreover, with both bow and stern thrusters she is owner-operable! As can be seen, this used 72′ Uniesse yacht is loaded with features and upgrades. Likewise this includes her under water lights, custom soft top, teak decks, and more. She features upgraded air conditioning throughout her Italian Designed interior. Additionally, all tables have been replaced since original. Therefore they are all in excellent condition and much larger than the original ones. This includes a separate dining table outside the galley. All in all that table seats six comfortably. For more information on this used 72′ Uniesse yacht be sure to contact Brent DeSellier today! MAJOR price reduction on this beautiful 72′ used Uniesse yacht! 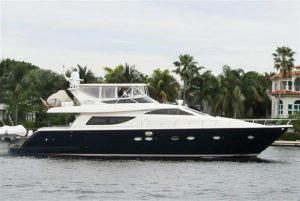 Price reduction on this beautiful used 72′ Uniesse yacht for sale in Florida!